Can You Find the Hidden Gems in the Greater Western New York Region? You are here: Home / Western New York State of Mind / Can You Find the Hidden Gems in the Greater Western New York Region? What hidden gems lay undiscovered within the boundaries of the greater Western New York region? We’re in the process of collecting the best resources on the web, and we’re looking for your suggestions! Got a pointer to a cool blog or an informative forum? Send us a tip using the form on this site: GreaterWesternNewYork.com. Stay tuned as we unveil this new site celebrating all there is to love about Western New York State. We’ll be covering art, commerce, cuisine, history, sports, real estate, nature … you name it. We’re looking for both links and potential contributors and people who can help realize the vision. I’ll have my business be one of the sponsors, so we won’t have to worry about funding the initiative. We want to create a “go-to” site where people living in and visiting the greater Western New York region can “go to” in order to find out the latest happenings, interesting destinations and fun facts. What’s more, we want to promote those individuals and companies who’ve already laid the groundwork. We want to highlight the best community blogs, the best places to see and, in general, those hidden gems others would be willing to go the extra mile to experience. By the way, don’t expect just another listings site. This site will contain curated content. That means we’re looking for the BEST, both in terms of what the region has to offer and in terms of resources to help find that good stuff and keep on top of it. There’ll be something for everyone … the sports fanatic, the outdoors person, the young family, the foodie, the history buff, etc. We’re looking for the BEST, and you can help us find it. 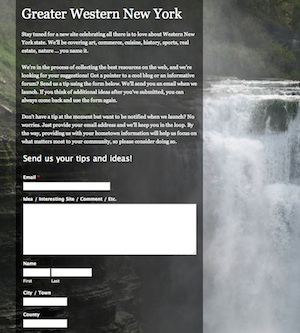 Send us a tip using the form on this site: GreaterWesternNewYork.com. We’ll send you an email when we launch. If you think of additional ideas after you’ve submitted, you can always come back and use the form again. Don’t have a tip at the moment but want to be notified when we launch? No worries. Just provide your email address and we’ll keep you in the loop. Here’s an important note: providing us with your hometown information will help us focus on what matters most to your community, so please consider doing so. I encourage you to write about the site on your own blog, to tweet about, etc. – and be sure to link to it. I also encourage you to not be shy about promoting your own site. If you think it’s good, others may want to discover it. The greater Western New York region is rife with hidden gems. Would you like to share those that you know? Please consider entering them in GreaterWesternNewYork.com. A greatest hidden gem in Western NY is in Holley NY. Check out my blog then write me if you want to know more.